Susanne will discuss our current cultural crossroads as a basis for the thesis presented in her multi-award winning book Deep Living: Healing Yourself To Heal The Planet. Our singular cultural focus on profit has not only destroyed our environment and our culture at large, it has also made us as individuals oblivious to the things that truly matter in life, and make it enjoyable and meaningful. Susanne will discuss the “new millennial values," how and why a cultural turnaround must begin within, and how to do so. This talk is being held at Mt. St. Mary College’s Desmond Campus for Continuing Education. Learn about the changes in the publishing industry and your many self-publishing options. I will be a guest speaker at the monthly GPL Writer’s Community gathering, and the event is open to the public. Deep Living: A new value system to lead us beyond the current cultural crossroad. I will discuss our current cultural crossroads as a basis for the thesis presented in my multi-award winning book Deep Living: Healing Yourself To Heal The Planet. Our singular culture and economic focus on profit has not only destroyed our environment and our culture at large, it has also made us as individuals oblivious to the things that truly matter in life and make it enjoyable and meaningful. WE will talk about the “new millennial values,” how and why a cultural turnaround must begin within, and how to do so. This talk is being held at the Port Jervis Free Library. See website for complete program and registration. The event is being held at Locust Grove in Poughkeepsie, NY. Join me at the Valley Cottage Library for an informal talk and discussion on the possibilities and pitfalls of self-publishing. Please sign up though the library website. 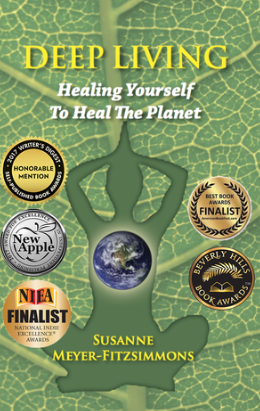 Book signing at Ye Olde Warwick Book Shoppe at 31 Main Street in Warwick on the occasion of Deep Living: Healing Yourself To Heal The Planet’s 5th book award. Holiday gift wrap available with your dedicated and signed book. 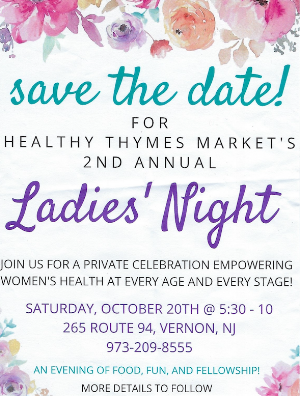 Join Dani Segal, nutritionist, co-owner of Healthy Thymes, wise woman and elder, for an evening of food, fun and fellowship for this private celebration to empower women’s health at every age and every stage. I have been invited to hang up my shingle for the night and contribute advice, books, and words of wisdom. See here for retreat details. A discussion on the writing process with Susanne. This talk is part of Amy Lewis Sweetman's community lecture series Do You Love What You Do, and currently held monthly at Penning's Farm Market in Warwick. Susanne will talk about her passion for a sustainable, compassionate, meaningful, and a good-for-all, not just a good-for-some, life. Get tickets through Eventbrite by following this link. 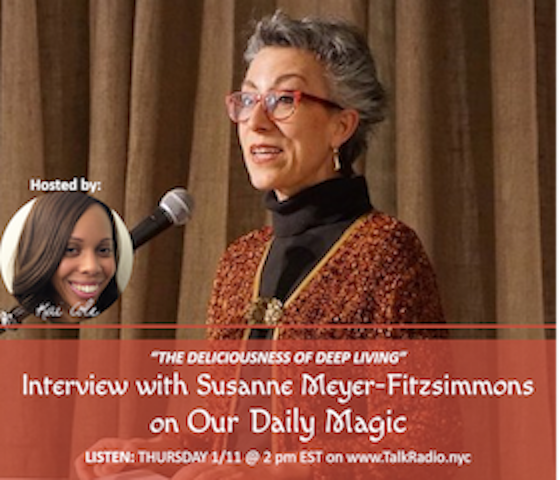 Susanne will be Kai Cole's guest on her radio talk show Our Daily Magic on New York's Talk Radio. While Christmas shopping in picturesque Warwick on Saturday, December 16, stop by Ye Olde Warwick Book Shoppe, where Susanne will happily sign your Christmas gift copies of Deep Living and Wisdom, her latest book, due out December 2, between 1pm and 4pm. Susanne will be signing her book, DEEP LIVING: Healing Yourself To Heal The Planet, on the Saturday of this beautiful holiday market. With comprehensive chapters on better ways to grow food, and better ways to relate to and celebrate food, the Warwick Valley Farmers' Market is the perfect venue for Susanne's signing of her recently published book DEEP LIVING: Healing Yourself To Heal The Planet. Part of Warwick's sesquicentennial celebrations this year, Second Sunday Conversations are happening throughout the year in different locations throughout Warwick. The subject of this Sunday's conversation at the Albert Wisner Library is "Warwick: The Writer's Den." A panel of six Warwick-based authors will discuss how Warwick inspires their craft. We are all actors in a real-time cultural and environmental drama. It can be scary and confusing, or rewarding and incredibly creative, but we need hope and a vision. DEEP LIVING offers that vision. Join Susanne at Warwick's Albert Wisner Library this evening as she discusses her book DEEP LIVING, how to put meaning back into life and create a good-for-all, not just a good-for-some, life. Register at the library 845-986-1047 x3. Join the Sustainable Warwick Book Club and the author at Warwick's Albert Wisner Library for a discussion of Susanne's book DEEP LIVING. Register at the library at 845-986-1047 x3. The second in a series of Cultural Chats on issues of sustainability, values, and meaning. "Amazon or your local bookstore? Why and how it makes a difference where you buy your books." Susanne will start the evening with a 15-minute talk, followed by a discussion with the audience. The Book Shoppe will be displaying books on the subject of localism and local economies. Call the bookstore at 845-544-7183 for more information. Ye Olde Warwick Book Shoppe and local author and cultural critic, Susanne Meyer-Fitzsimmons, have teamed up for a series of Cultural Chats at the Book Shoppe. Susanne will start the evening with a 15-minute talk, followed by a discussion with the audience. The Book Shoppe will be displaying books on localism and local economies. Call the Book Shoppe at 845-544-7183 for more information. Come visit The Green Onion in Chester, NY for their Mother's Day Bazaar from 10am - 4pm and browse for Mother's Day presents. Susanne will be signing her new book DEEP LIVING: Healing Yourself To Heal The Planet. Sip some wine while Susanne reads excerpt from her new book DEEP LIVING and talks about how the book came about. Signed copies will be available for purchase..
Susanne will moderate a series of 4 informal, informative, interactive, and reflective chats that invite a deeper connection to aspects of everyday life. Culturally, we have become very adept at criticizing people, things, and our lot in life. We need to relearn to formulate what we actually want, to acknowledge what we love, to formulate what we wish to experience and do in order to live a meaningful and rewarding life. Each talk centers around a selected blog from Susanne's Holistic Living blog and connects with one of its subjects. All chats are held at the Albert Wisner Library in Warwick, NY and are free of charge. Dates are Mondays 2/13/17, 2/27/17, 3/13/17, 3/27/17. Please call the Help Desk at 845-986-1047 x3 to register. Susanne will moderate a series of 6 informal, informative, interactive and reflective 45-minute hats that invite a deeper connection to aspects of everyday life.